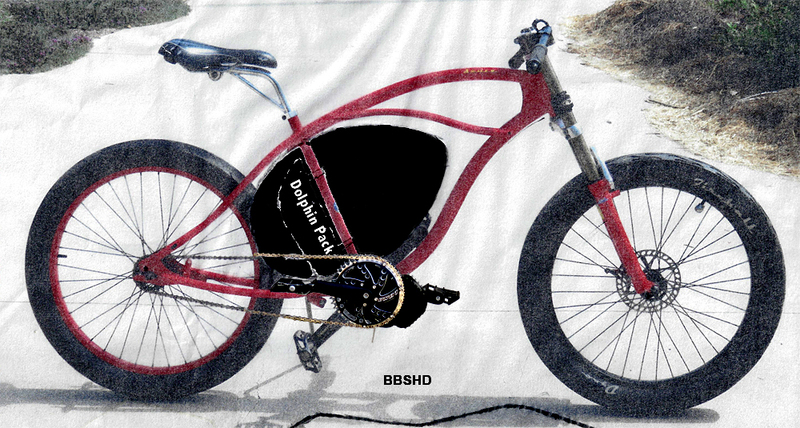 DYNOeDeuce – BBSHD – Current project. The image is a bit grainy because it’s a mock up of 3 different layers and a tracing paper overlay. The bike is a GT DYNO Deuce. Check out the cool lines of the seat and chain stays – so lovely – elegant even. My new eBike project the GT DYNOeDeuce. The bike is the quintessential SoCal cruiser – designed in Santa Anna in the late 1990’s. This version sports custom triple crown forks. I will add disc brakes, clipons, lights and horn, and that fabulous BBSHD electric motor kit and 52v 13.5ah lithium battery. More traditional seat with a black seat post, or a cafe racer seat. The hand crafted “body work” will be black anodized 6061 T6 aluminum. The lights and horn will make it street legal as a motor vehicle – because it’s FAST.